Booyah chicken, beer brats, cheese curds... Wisconsin is home to so many wonderful culinary traditions, we can't possibly list them all. And there's no better way to prepare and serve them than on our Wisconsin shaped cutting & serving board. 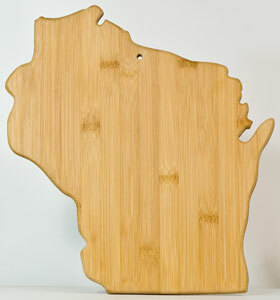 Crafted from organically grown bamboo, this board is easy on knives, built to last, and Wisconsin proud! Measures 13" x 12" x 5/8"